If your wishing to buy a latest designed and stylish saree, visit one of the famous and well established saree showroom of Udaipur city. 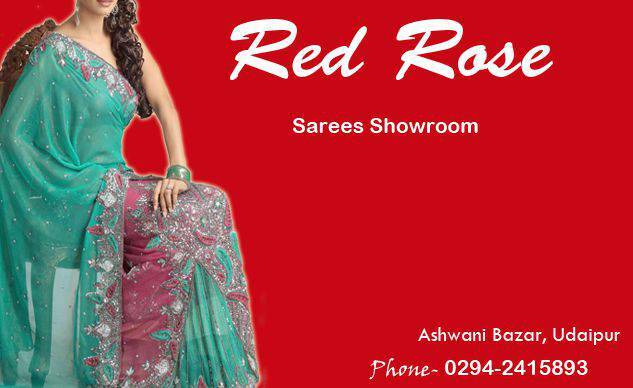 Red Rose, an exclusive saree showroom is situated on ashwini bazar main road, Udaipur. Red Rose is dealer of exclusive designer sarees, traditional sarees, rajasthani sarees, Indian sarees, casual sarees and party wear sarees. They have huge range of exotically designed sarees collection. The magnificent designs and patterns will enhance your beauty and style statement. Red Rose is known for its trustworthy customer service. Satisfying many customers since a long time, it has created a brand image for itself. You are most welcome to the Red Rose Showroom.